Pee Wee was like David Lee Roth; you either loved him or you hated him. The Matchbox vinyl Playhouse is my personal favorite from the line. King of Cartoons - The King with his Crown! 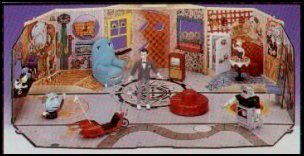 These toys were dumped by stores after Pee Wee's alter-ego's incident. find and regularly brings $45-$50.